For babies with special needs, sound sleep requires more than a lullaby and a kiss. According to pediatrician William Sears, MD, author of The Baby Sleep Book and The Fussy Baby Book, infants with special needs sleep differently than their peers, typically taking longer to nod off, waking more frequently, and taking longer to develop regular sleep patterns. Naturally, this leads to severely sleep deprived parents. All parents need the patience and problem-solving abilities fostered by restful sleep. Here are tips to help your baby with special needs sleep more soundly (always consult your pediatrician with questions). Infants with special needs may have hypotonia, or low muscle tone, which is linked to Down Syndrome, prematurity and some neurological conditions. These babies seem “floppy” and take longer to reach motor-skills milestones like holding the head up, rolling over and sitting. They often respond well to swaddling, which can improve muscle tone by giving their small limbs something to push against. Bonus: Swaddling is also known to promote calmer, more restful sleep. 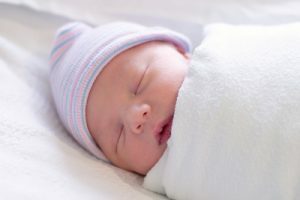 Be sure your child’s swaddle doesn’t extend above the shoulders—bunched-up fabric could restrict breathing—and check with your pediatrician about swaddling around the hips. Tight swaddling on a baby’s lower half may be linked to hip dysplasia, a condition in which the hip joints don’t develop properly. The International Hip Dysplasia Institute recommends HALO and Just Born brand swaddles, which gently hug a baby’ arms and torso while leaving hips in the proper position for optimal development. Dr. Sears notes that babies with special needs are highly sensitive to external stimuli; they’re less able to tune out distractions, making it harder for them to fall asleep. These babies might hone in on a ray of light, a warbling songbird, or the sound of cars humming by on the street, and may struggle to switch into sleep mode, even when they’re tired. To help these babies relax into sleep, create a healthy, restful sleep environment: block out all external light, using felt blackout curtains if needed; use carpet, drapes and white noise to buffer and block sound; and keep the sleeping space a cool and comfortable 68-72 degrees Fahrenheit, which promotes deeper, more restful sleep. Older children with special needs may respond well to weighted sleeping blankets, tight sheet tucks and tightly fitted sleep garments because snug compression helps them feel secure at night. Unfortunately, these items may not be safe for young infants. But a pre-bedtime infant massage can provide calming sensory stimulus that helps your baby relax. A study in UK journal The Practising Midwife notes that infant massage can help parents bond with baby while learning to decode their infant’s communication signals. Per Dr. Sears, high-needs infants take longer to wind-down for sleep, and may require extra cuddles and soothing before bed. Allow ample time—45 minutes to one hour—to transition into bedtime mode, and use a consistent nighttime routine, with the same elements performed in the same order night after night, to help cue your baby’s brain that sleep is near. Keeping your routine consistent will help your tired, wired little one wind down, relax and finally get some rest.